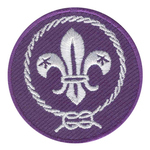 All Scouts through out the world wear this badge to show that they are part of the World Scouting Movement. All Scouts in Australia wear this badge to show that they are a member of the Scouting movement in Australia. The First Aid Badge may be worn by Venturers who hold a current (certification completed within 3 years) first aid certificate (standard HLTAID003 First Aid or higher) from any Registered Training Organisation that delivers first aid training (eg St John). The training may be completed through workplace or volunteer training. 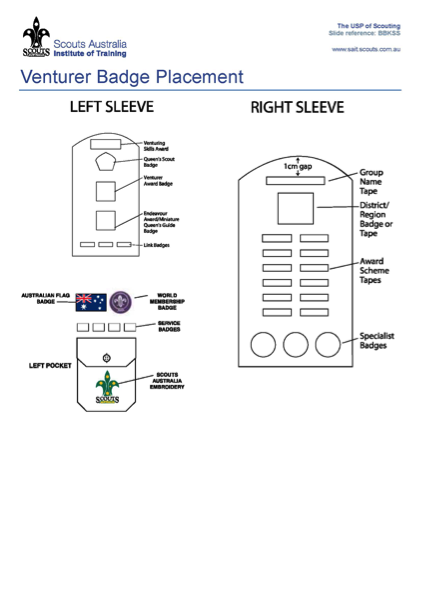 The badge is worn on the lower right sleeve alongside other special interest badges. As a Venturer Scout you may gain an Anchor Badge by reaching and maintaining the competencies (required standards) for the appropriate water craft, e.g. canoe, sail, kayak, sea kayak, power boat etc. 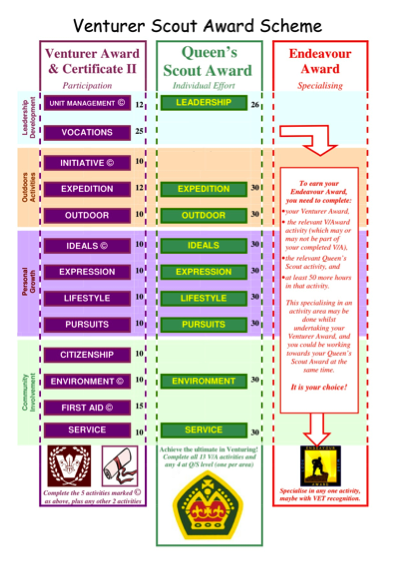 The standards required for Scouting are as set out in the nationally accredited current Sport and Recreation Training Package and reflected in the current version of the Scouts Australia Institute of Training (SAIT) Adventurous Activities matrix at Level 1 Skills Pre-requisites must be able to be demonstrated as per the SAIT matrix. If you are keen on water activities you may undertake to complete your Anchor Badge (canoe, kayak and or sail). This is organised by your Branch Water activities teams or equivalent. Reassessment or renewal of your Anchor Badge competencies every three years. Maintaining a personal log book (recording date and all activities undertaken). This Award was introduced in the year 2000 for all members of Scouts Australia, with the intention of raising the level of awareness of youth members about our Veterans and providing Scout members with an opportunity to actively participate in the “Their Service – Our Heritage” program. This is an annual award and is achieved each year with the year commencing on 25th April. The badge will have a different coloured edging each year.